WMU of Texas is excited to announce that Tamiko Jones of Arlington, Texas is the new executive director-treasurer effective November 1, 2017. She comes to this position with a wealth of missions and ministry experience plus business expertise. I love to ballroom dance. Gliding effortlessly across the floor. Being swept away by the music. In the arms of a partner whose only job is to make me look beautiful. Believe it or not, James’ letter to a bunch of early Jesus-believing Jews contained a dance as well. I was so impressed by last years theme and scripture Joshua 4:6 "that this may be a sign among you when your children ask in time to come, saying What do these stones mean to you." DALLAS—When friends approached Sandy Wisdom-Martin about being considered as the next executive director of national Woman’s Missionary Union, she recalled having “a long list of valid reasons” why she should not. Sandy Wisdom-Martin found joy in her role as executive director-treasurer of Woman's Missionary Union of Texas and grew to love the staff. She has been in my life for over 20 years. Watching her grow from a girl into a mature young woman has been so much fun. Beautiful, funny, warm, loving, smart and wise are all words that describe my friend. Not having children of my own I feel blessed that her parents invited me into their family. Lots of great conversation happened around the dinner table as we shared together who Jesus is and how He is at work in the world around us. Through 2018, the Texas TTT Endowment will benefit Missionary Kids (MKs). Each year, WMU of Texas sets aside $6,000 to help Texas MKs returning stateside attend the MK Re-Entry Retreat. WMU of Texas will host the national event in 2018. This retreat has all the features of a weekend camp experience along with time for MKs to immerse themselves back into life in the United States. For many, this event offers a great opportunity for them to fellowship with other MKs, learn current affairs, and be loved on by WMU. The average cost for travel per MK is $350. Send the Boat Back from WMU of Texas on Vimeo. We have a tremendous opportunity to support the future of missions in our state while we honor the legacy of a WMU of Texas leader. Jeane Law loved Texas and missions. Joy Fenner says of Jeane, "My favorite memories include Jeane's genuine love for missionaries and their kids. It began when she was a Sunbeam (preschool missions organization). It grew and developed as she grew. That love expressed itself in multiple ways and continued throughout her entire life." Every year, Woman's Missionary Union® chooses a handful of young women to serve as National Acteen Panelist. The girls that are chosen as Panelist obtain qualities that show leadership, serving hearts, and a strong relationship with Christ. The 2016 National Acteen Panelist consists of three girls from the state of Texas. Hannah Hutton from Hyde Park Baptist Church in Austin, Jemima Louis from Tallowood Baptist Church in Houston, and Ana Sandoval from Freeman Heights Baptist Church in Garland. Imagine enrolling in a job corps program and having your entire life transformed. That's exactly what happens to many who pass through CWJC and CMJC. Program participants receive training in life skills and job readiness, and, along the way, gain self-confidence, purpose, direction, and hope for the future. What a deal! Texas Baptists River Ministry connects and assigns churches to specific projects along the Texas/Mexico border as well as in the top 10 most populated cities of Mexico. The ministry is made possible by funds given through the Mary Hill Davis Offering. The Week of Prayer for Texas Missions and the Mary Hill Davis Offering is September 13-20, 2015. Click here for resources for your church to help promote this special offering in your church. For her birthday last year, IMB missionary Staci Powers' most treasured gift was having her husband hold her hands without letting go. The fact that he had forgotten it was her birthday did not matter at that moment. Four days later, on July 10, 2014, Staci held her husband Jeff's hands for the last time as cancer took over his body. Last weekend, Staci boldly stood on stage at the Woman's Missionary Union (WMU) of Texas Annual Meeting and Missions Celebration, fighting back tears as she told her story. VILLA FRANCA, Spain - Even when verbal communication seems impossible, there's one language that is spoken by all: love. It can be spoken through hugs, laughter and 60 quilts hand-made by Texas Baptist women. 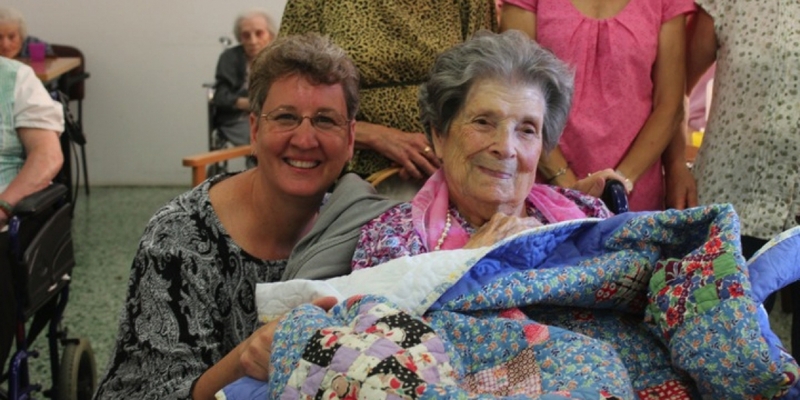 The quilts were a part of Woman's Missionary Union (WMU) of Texas initiative "Covered with Love" in which they presented the request for 50 quilts for the Evangelical Baptist Retirement Home in Villa Franca, Spain. GARLAND - On January 14th, Nayely Vallejo received a call, the call she had been waiting for for a long time. "Congratulations" is all she heard and she knew that all her praying and putting her faith in God paid off. The call she received was recognition that she had been one of four selected to serve as a National Acteens Panelist, and the only one selected from Texas. "I began to cry happy tears," said Nayely.